You know you should eat your veggies. But do you ever look at a head of cauliflower and feel… uninspired? Well, I’ve got a method for cooking vegetables that really brings out the excitement, plus some unexpected and amazing flavors. It’s roasting, and it’s how I do most of my veggies these days. Roasting is quick, it’s easy, and it creates veggies that are crispy, chewy, caramelized, delicious. Pick a vegetable you don’t normally like – brussels sprouts? Broccoli? Carrots? Now stick ’em in the roaster, and I pretty much guarantee you’ll be craving them the next time you’re looking for a nutritious and tasty side dish. Chop vegetables of your choice into large chunks. Good roasting vegetables include brussels sprouts, artichokes, cauliflower, broccoli, carrots, potatoes, and rutabegas. 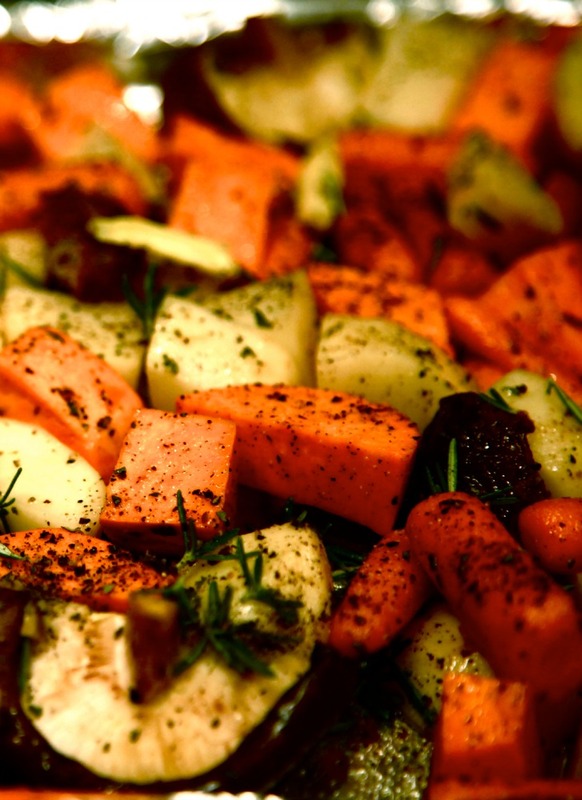 Spread veggies on a cookie sheet or in the bottom of a roasting pan. Drizzle olive oil generously over vegetables. Toss vegetables to coat them in the oil and seasonings. Place in a 450-degree oven for a half-hour. You can roast them longer if you like more of a chewy, caramelized texture and flavor, shorter if you like your veggies more raw. Serve with barbecued meats, roasts, etc. You can even let the veggies cool, then toss them in a summer salad – roasted bell peppers and asparagus are especially good for this purpose. mmmmmmm!!!! You just inspired me! I love making veggies like this but haven’t done it in awhile! I’ll add this to my menu plan for the week! Thanks for the reminder! This is true! I made brussel sprouts and they were good this way, not bitter. This sounds so delicious. I can’t wait to try! I agree, sounds yummy. Printing it and putting it in my recipes folder.